The success of the TV show The Great British Bake-Off has rekindled Britain’s fondness for baked products. Not that it was in any danger of declining. Rather than heading to Greggs though, more cooks are discovering the joys of creating their own pies and pasties. These are ideal for packed lunches or picnics. Pastry can be home-made, but supermarket ready-made puff and shortcrust pastry reduce the workload considerably and mean the cook can concentrate on ensuring the fillings are delicious. For pasties, a slow-cooked beef and vegetable stew makes a great traditional filling. Add carrots and diced turnip to shin of beef and cook in ale and beef stock. Ensure that the stew is cold and not too liquid when you add it to the circle of rolled puff pastry. Fold, crimp the edges and brush with egg to give a golden finish in the oven. Spinach and feta cheese combine brilliantly with pastry for a taste of the Aegean. Add a little grated nutmeg, ground black pepper and some parsley for flavouring. There is no need for salt as the cheese is already quite salty. Chicken can be dry in a pie unless combined with a rich white sauce and possibly mushrooms. Ham also complements the chicken and gives the pie another dimension. Add a hint of tarragon or chopped cranberries for flavouring. 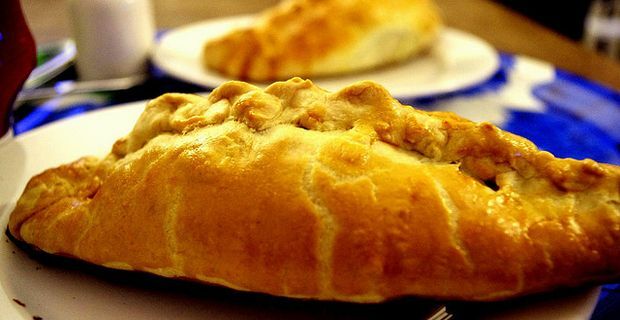 Vegetarians will love a strong cheese and onion pie or pasty. Use diced potato to give the filling body. Caramelise the onions and bind the filling with a cheese sauce flavoured with mature cheddar.